Home > Is Black Friday as big of a deal as we think? With another Black Friday just past, we take a look at the origins of this relatively new tradition and how it has become an ingrained marker for the start of our festive splurging. The concept was first introduced by American retailers keen to capitalise on the Thanksgiving holiday, a time when many people are off work and looking to shop for presents in the build up to Christmas. Big chains like Walmart and online retailers such as Amazon started the trend, which has continued to snowball every year for the past decade. Having gradually made its way across the pond, the Black Friday tradition has well and truly set up stall in the UK. This day has once again shown that more and more retailers are embracing the idea, but are extending the discounts for the entire weekend rather than just a single day. However, if this year has taught us anything it’s that there’s beginning to be a slight shift in attitude, with less brawling in the department store aisles and more online bargains popping up across the web. In an increasingly digital world where people can now browse and buy items within a few clicks on their mobile, perhaps future Black Fridays will see retailers investing more in their online presence and less on front door security. 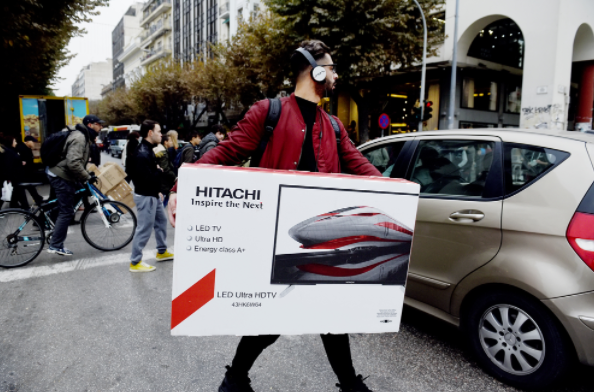 Don’t forget that Black Friday is designed by retailers for retailers, particularly those looking to sell more electronic goods like TVs, laptops and video game consoles. It’s unlikely that customers will keep tabs on the sale of electronic goods at other times of the year, which means we are left to assume that the Black Friday deals are by far the best out there. Not necessarily. Often there’s not too much difference in price, if any. So, if you feel like you’ve missed out on the best bargains, or if you’re planning on rushing out to the shops next year, make sure you do your research and don’t spend for the sake of it. Is the Internet changing our holidays?